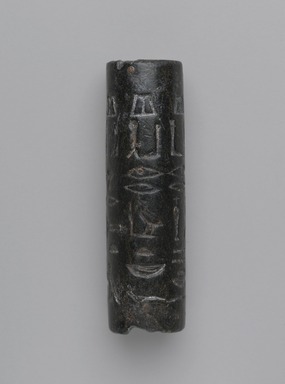 Long black steatite cylinder seal, very large perforation. Inscription in five vertical columns giving the Horus name and cartouche of King Mery-re (Pepy I) together with the titles of a Lector who is not named. Inscription reads: "The Lector-Priest, Chief over the secret things, the Lector-Priest, doing what his Lord commands, the Lector-Priest, doing what his Lord praises, King of Lower and Upper Egypt, Mery-re, living eternally, the Horus Mery-taui, Mery-re." Condition: One large and several smaller chips at top and bottom.